Is your boss is irritating , a micro-manager or clueless? Does he put insulting notes on memos that co-workers can see? Does he throw things? Here’s a guide for dealing with an irritating boss. 1. When your boss calls your name, take a deep breath. It will all be over soon. 2. If you are called into his office and told to shut the door; smile, shut the door, sit down, and shut up. He can’t say anything you don’t already know, and if he says something that you deem incorrect, you have the right to defend yourself. Present yourself with confidence. 3. By now you’re probably pissed. If you don’t smoke cigarettes, go outside anyway. Call a friend. Grab a co-worker and go have a laugh in the pantry or anywhere that can keep you away, even if for just a minute. 4. Having co-workers who you really get along with should be at the top of your list of “reasons to stay in this job.” There are so many stressors in the workplace, but if you have people around you who you can relate to, it helps calm your nerves and control your emotions. 5. 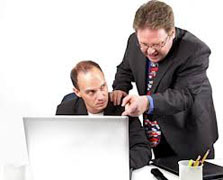 If you work in an environment where you hate your co-workers as much as you hate your boss, then call someone. your friends mom, dad, or brother could help cheer you up. You could also visit metroholica.com to get some useful tips. 6. Don’t forget who you are. Never let someone make you feel like less of a person. don’t let anyone ruin you happiness, don’t be a victim. And if you ever feel that it has gone too far, go to the next person above your supervisor. If all else fails, call the HR. or find a new Job.